Milk is the perfect beverage for today's kids, teens and adults as it is power packed with nutrition. There are different varieties of milk available in market for consumption. In India, the term milk refers to cow's milk, buffalo's milk or a combination thereof. Milk contains fats and Solids-not-Fat (SNF) comprising protein, carbohydrates, vitamins, minerals, etc. Whole milk. Whole milk is the one which does not have its fat or cream removed. It has the fat content of 3-3.5%. The whole milk has a better taste compared to the other milk variants. Skimmed milk. Skimmed milk is one where as much fat is removed as possible. It contains 0.5% fat and has a slightly more watery appearance than other types of milk due to its reduced fat content. Toned milk. Toned milk is obtained by the addition of water and skim milk powder to whole milk. This contains not more than 3% fat. Double toned milk. This is also similar to the toned milk, where the milk is obtained by addition of water and skim milk powder to the whole milk and contains minimum of 1.5% fat. Full - cream milk. Milk that has its cream blended in and homogenized. It has 6% fat and is recommended for children, based on their age, weight and other lifestyle factors. So, which milk should you choose? 1. Weight watchers should opt for skimmed, toned or double toned milk as it has reduced calories and fat. 2. Children can be given whole milk for their proper growth and development. If overweight, they can be switched to skimmed milk. 3. 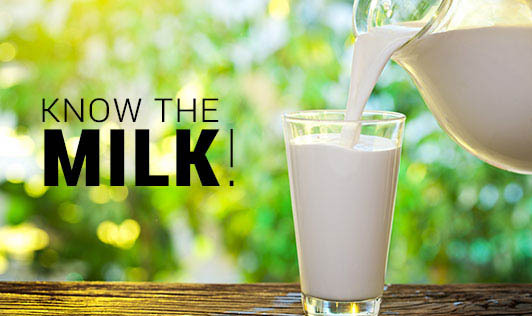 Adults with lifestyle disorders like obesity, diabetes, cardio vascular diseases, hypertension, elevated lipid levels etc should go for skimmed or double toned milk. So, make sure you read the label when choosing the milk for you and your family! For more information on selecting the right one, speak to your health experts/ Dietitians, who can guide you according to your lifestyle and other factors.